Mon. Feb. 9. Stood a watch last night bet. 12 & 4 AM. I was captain of that particular watch detail and had to get up at 11PM and start waking the rest of the boys - sure didn't get much sleep for I was up at 5:30 with the rest of the boys. 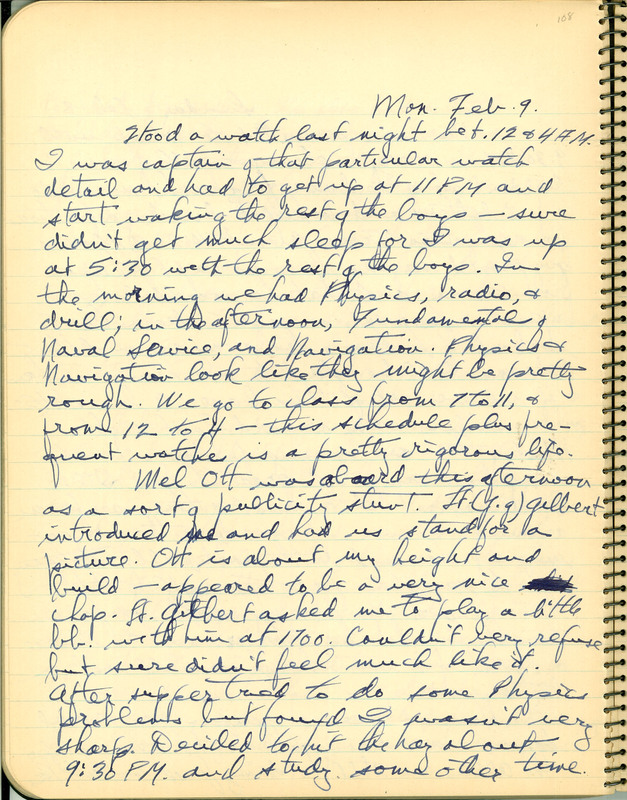 In the morning we had Physics, radio, & drill; in the afternoon, Fundamentals of Naval Service, and Navigation. Physics & Navigation look like they might be pretty rough. We go to class from 7 to 11, & from 12 to 4 - this schedule plus frequent watches is a pretty rigorous life. Mel Ott was aboard this afternoon as a sort of publicity stunt. Lt. (j.g.) Gilbert introduced us and had us stand for a picture. Ott is about my height and build - appeared to be a very nice chap. Lt. Gilbert asked me to play a little bb. with him at 1700. Couldn't very refuse but sure didn't feel much like it. After supper tried to do some Physics problems but found I wasn't very sharp. Decided to hit the hay about 9:30 PM. and study some other time.